The Porsche 911 GT2 RS was sold out long ago, but can't keep its 700-horsepower shenanigans out of the news cycle. A stock version recently set the lap record at Road Atlanta, after doing the same at Willow Springs and Laguna Seca. 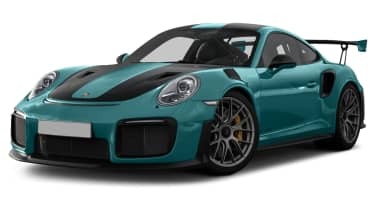 Before that, a modified GT2 prepped by Manthey Racing, the GT2 RS MR, set the Nürburgring lap record for modified production cars with a time of 6:40.03. The Manthey – pronounced MAN-tie – version bested a stock GT2 RS by 7 seconds and the Porsche 918 Spyder by 17 seconds. Chris Harris took the black-striped coupe to Portugal's Portimao Circuit for Top Gear, not only setting a new circuit record, but besting his best lap time in the McLaren P1 by two seconds. It's important to note that Manthey's car doesn't make any changes to the engine. The aerodynamics, suspension, wheels, and tires have been changed, but the car is still street legal, even on its Michelin Pilot Sport Cup 2 R rubber. On that note, it should be noted that Harris set his P1 time on Pirelli P Zero Trofeo R tires. On the GT2 RS MR, the German racing firm installed the KW3 suspension with helper springs from the Porsche GT3 R race car. Harris called the setup "miles better than the standard suspension," the standard unit itself very good. New brake pad material provides better bite, behind lighter BBS magnesium wheels. Dive planes, a new front splitter, a Gurney flap, new wing rear endplates, undertray changes and a new rear diffuser, and taking some rake out of the car keep everything more planted. The changes would cost an owner 90,000 euros, but they clearly pay for themselves. Harris says the tweaks don't tame the car – "this is a yob," he says, "this thing, it wants to slide everywhere." However, watching Harris set his fast lap time, except for a minor moment coming through the last turn it looks like he's headed to Whole Foods to pick up some quinoa. That speaks to how good the GT2 RS already is, and how much better Manthey made it. Check out the video for Harris' take on the car, and enjoy his take on Alcantara steering wheels, which "have a bit too much DNA from other people in them."